I was overjoyed to receive very sincere gifts from my kids for my birthday. 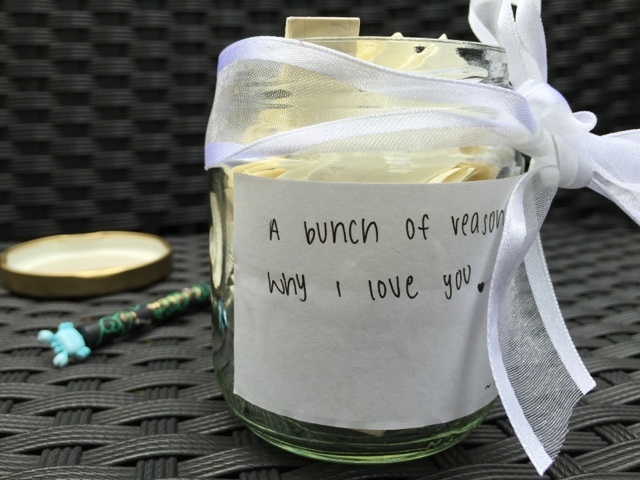 #3 gave me a jar which read, "A bunch of reasons why I love you", and she filled it with 30 little slips of paper stating why. Such a darling. You always let us go out with our friends. You didn't stress much on studies. You are not a typical Singaporean mum. You raised us with proper morals. Your cooking is still edible. You raised an amazing kid, which is me. You are better than most mums. You let us do a lot of crazy things. You have nice clothes, which you don't wear. You raised me to be independent. Have my girls really grown up? They attempted to create an art piece with Kate, although it did not turn out as expected. They glued the crayon sticks onto the canvass and blasted the hair dryer over it. 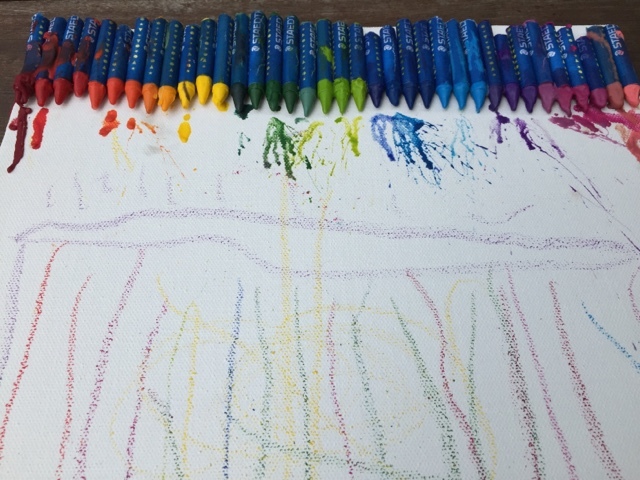 Somehow, the crayons didn't melt as it should. In the end, they got Kate to draw some squiggly lines. Still, I like it! 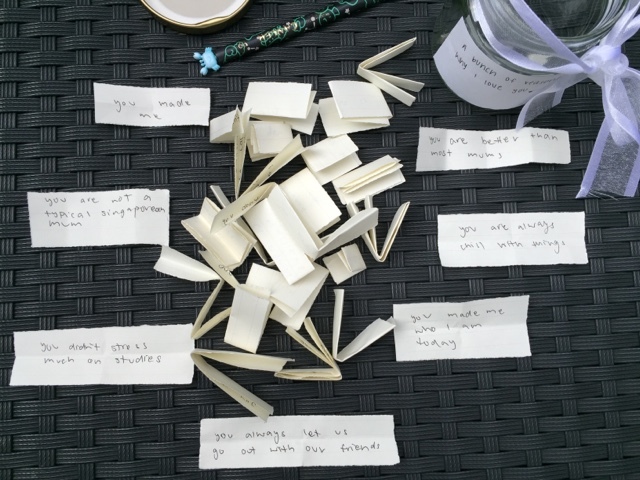 When #2 presented me her gift, I was so impressed. 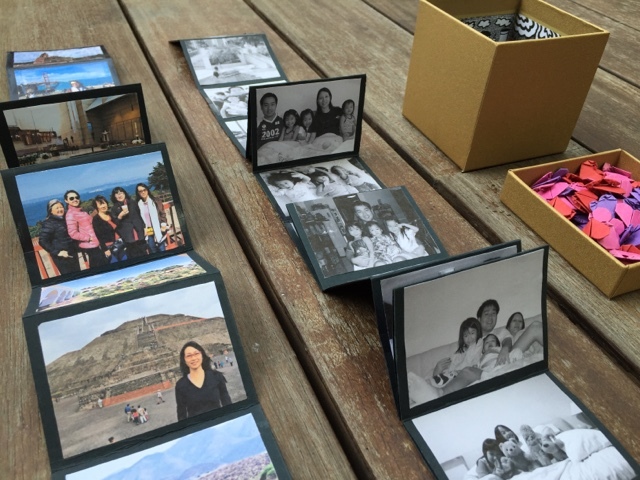 She made the effort to print out our photos over the years, cut them all nicely, categorise them, and stick them onto the strip. She did it on both sides and it unravels beautifully. She went the extra mile by decorating the box, drawing on every inch of the paper and gluing it on. Can you spot the 'happy birthday' written on it? 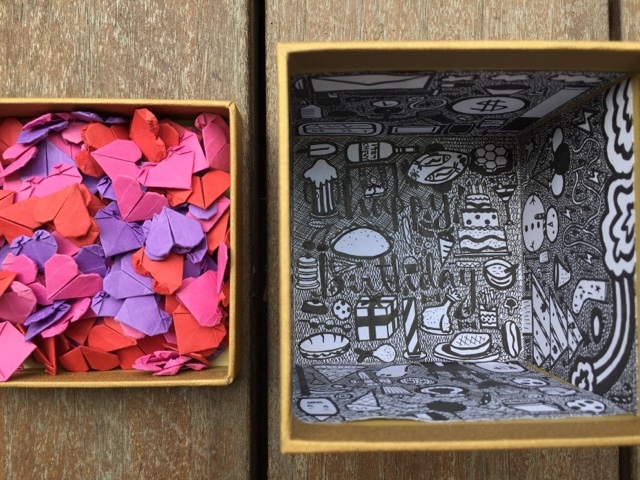 She folded paper hearts as a cushion for the photo roll. 100% for effort! So heartening to see that all the sacrifices I have made in raising them is being appreciated. Isn't that all we wish for as mums? Of course! Auntie Pam is very cool!